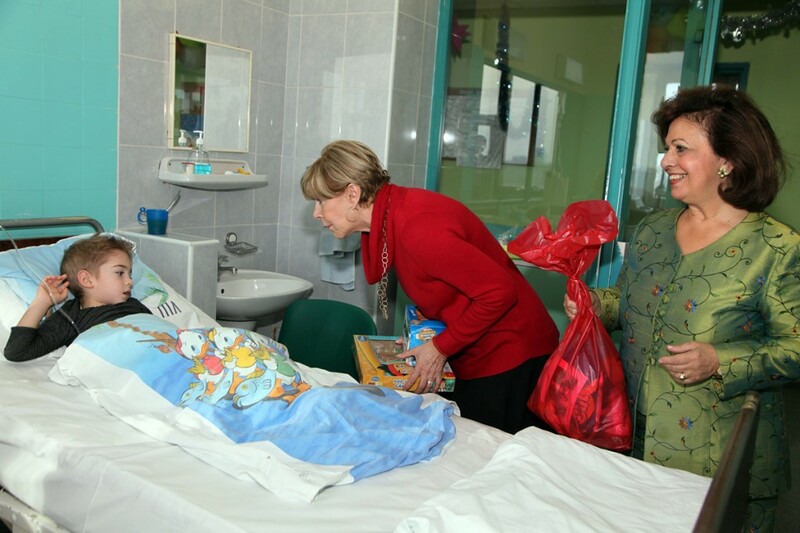 Her Royal Highness Crown Princess Katherine traditionally visited children’s hospitals in Belgrade on Christmas Day, and gave Christmas presents to the children. Crown Princess Katherine visited University Children’s Hospital Tirsova and Institute for Mother and Child. Her Royal Highness was accompanied by Mrs Kathy Fanslow, President of Lifeline Chicago Humanitarian Organization,along with her daughter Miss Tracy Armstrong they brought presents for the children that were gathered by Lifeline Chicago Humanitarian Organisation whose patron is HRH Crown Princess Katherine. “This is the happiest time of the year for me, because I am privileged to be with these children and to bring smiles to their face. I hope that the presents will warm them and give them hope during these cold winter days. Mrs Fanslow is our greatest of joy every year for Christmas and I am grateful for all the hard work she is doing to help our people”, said Crown Princess Katherine. The humanitarian aid was collected thanks to the Lifeline Chicago Humanitarian Organization under the patronage of Crown Princess Katherine.